Thank you to Erica Mesirov, our go-to Diet Coach, for this detailed run-down of how to choose the right snacks when we’re busy and on-the-go! When I hear people say that it’s not healthy to snack, I get really sad. Because I love snacking and I feel that the right snacks have been so helpful in my healthier lifestyle. Snacks fill me up, and keep me satisfied so I don’t feel like I’m starving and have to pig out later in the day. It’s just important to be aware of how to choose diet friendly snacks. Ideally we’d eat entirely fresh, whole foods. But who the hell has the time for that? I’m busy and constantly on the run. So often grab-and-go it is. 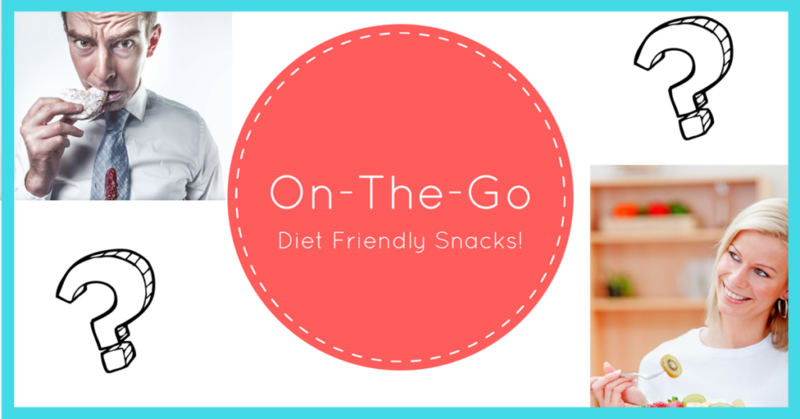 Today I want to talk about on-the-go diet friendly snacks. So that when you’re extra busy like me, you can grab something that will be awesome for you. So I’m gonna talk about a U.S. nutrition label. I know they differ a bit from country to country, but much of the basic information will be the same. I’m going to talk about the mistakes I used to make interpreting the label, and how I do it better now. Where would you look first on the nutritional label when picking an on-the-go diet friendly snack? If you said calories, great answer because that is where I always looked. But what I learned is that there are much better places to start. The first thing i do is read the ingredients. Every last one. Because this provides all sorts of beautiful information. Ideally, the ingredients list is somewhat small. Because the longer the list, usually the more crazy, processed ingredients. So Trader Joe’s has a newer, on-the-go diet friendly snack. I just tried it for the first time yesterday. It is Trader Joe’s Crispy, Crunchy Okra. Quiet honestly, I’d never tried okra! I wasn’t sure what to expect. But surprise! I loved it. Wow, that’s all things i know and can identify and pronounce. These are foods that will be more effectively processed by my body because they are real foods. This an awesome start! A personal pizza feeds 4 people? Next, I’m going to look at a serving size. Because a serving is a vague term. I once bought a personal pizza crust that said it contained 4 servings. Are you kidding me!! Who shares a personal pizza with 3 other people. The only way to understand the rest of the important information on the label is to understand their definition of a serving. The Crunchy Okra had 3 grams of sugar. And, from looking at the ingredients, I can tell that the sugar comes from natural sources, not added sugar. So, that’s pretty good. Then, I look at the carbohydrate content. I’m not against carbohydrates, but I’m against empty carbs (without nutrition), because those are empty calories and therefore fattening.The Crunchy Okra has 19 grams of carbs. But wait! Before I jump to any conclusions, I’ll look at the fiber subheading under carbohydrates. And there are 11(slimming) grams of fiber. Wow! Let’s talk about fat baby! Even in the year 2017, people are still afraid of fat. But fat is not the enemy. BAD FATS are. So the first thing I look for is trans fat. If there’s trans fat, I just usually move on. There have got to be better options. The next place on the label I move to is saturated fat. Because saturated fats are usually inflammatory and not diet friendly. The Crunchy Okra has 3 grams which is acceptable. If it comes from something like cheese powder, something overly processed or something fried, then I usually take pause. The Crunchy Okra has 14 grams of fat which I’ll say is also acceptable. Especially because you get so much in a serving! Most on-the-go diet friendly snacks are going to have a bit of sodium. This is inherent in anything processed. My goal, when looking at a label, is just to keep it as low as possible. The great news about the Crunchy Okra is that it has only 100mg of sodium which is only 4% of your daily allowance. Not too bad. I’m still mindful of calories even though it isn’t my main focus. Because, even if the food is healthier, I still don’t want to eat too much. Moderation is totally important. But I don’t give it quite as much weight (no pun intended) as I used to. I’m looking at on-the-go diet friendly snacks that should supplement a relatively healthy diet. If you’re eating crap at mealtimes, you probably don’t have as much room for extra saturated fats, extra sodium or whatever. It’s vital to be open to trying new things. I honestly thought Crunchy Okra would be icky. But when I tried it, I was really happy. It fulfilled my salt craving, and satisfied my hunger even though I only needed to eat half a serving! Here are some of Erica’s favorite, on-the-go diet friendly snacks! Of course, I have other go-to snacks for when I’m not worried about eating so healthy. It’s not about eating healthy all of the time. But these are good staples because they won’t screw up my diet. They keep me full. And they don’t make me feel like I’m eating rabbit food which is what I used to think I had to eat while dieting. Back when I was a yo-yo dieter. There lots of good options out there. And now you should be empowered to choose wisely. So, when you’re on the go, stock up on these on-the-go diet friendly snacks that won’t send your diet into a tailspin. ← Got Vacation Plans? Increase Circulation & Strengthen your Posture while on the Road!